It's a case of something-old-something-new for this week's new Xbox Live Arcade game. Super Smash Bros will never show up on the Xbox 360. It's one of the best selling franchises in games today, but since Nintendo's franchise is, well, Nintendo's, owners of Microsoft's console are going to have to do with the next best thing, and that would appear to be Small Arms. 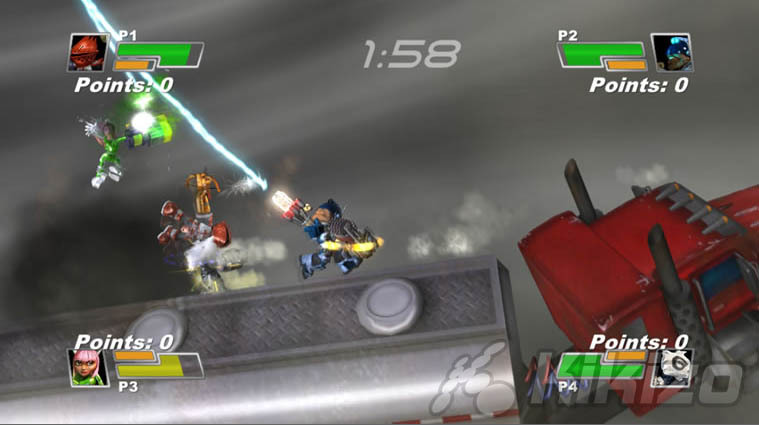 The developers at Gastronaut Studios describe the game as "a frantic multiplayer brawling game with the action and precision of an arcade shooter", though most people will see it and instantly think of Smash Bros. Nintendo's game, however, never had the bounty of four-player online multiplayer modes Small Arms has. "The idea was to mix the sort of ranged combat in games like Metal Slug, Contra, and Abuse with fighting and platforming mechanics," Don Wurster, one of the four members of the development team, told Firing Squad recently. "The interchangeable weapons started out as full 'armoured suits' ala Mega Man, but we ended up using just the gun-arm idea, and giving the characters in the game much more personality through custom models and animations." One of the more unique features of the game is something called Six Degrees Of Small Arms. Similar to the Kevin Bacon game that inspired it, this is an achievement that is passed between players, and only the developers have it to start with. Think of it as a disease you want to catch. This is the first original game to hit the Xbox Live Arcade in months, after a long run of re-releases of classic arcade games. Microsoft doesn't have the same luxury it's enjoyed for the last year, though, as the service now has competition from both Sony and Nintendo. Small Arms will be available to download from the Xbox Live Arcade from 9.00am on Wednesday, 22 December.